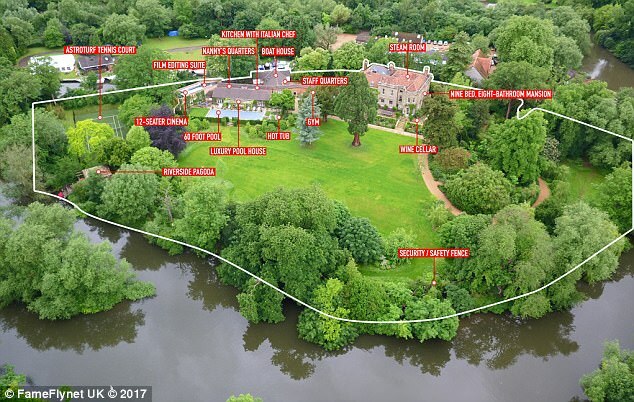 With high fences, state of the art security cameras on every shore, and resident bodyguards on constant vigil, George Clooney’s new estate on a private island in the Thames is something of a fortress. But as these pictures show, Fort Clooney came under attack from a rather unexpected enemy this week. As the Hollywood star and his wife Amal, a prominent human rights lawyer, welcomed their new twins into their Sonning home this week, a undignified assault on the property happened on the shore just a few yards from the house. The scene had been an idyllic one. Just the burbling of the backwater, the buzzing of dragonflies and the occasional volley of laughter echoing across the water from the Clooney estate. 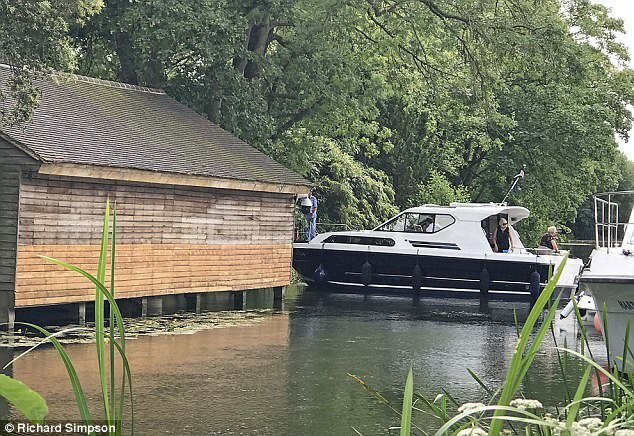 But calm quickly turned to panic as a large motor yacht loomed into view and attempted to turn round in the narrow straight between Clooney’s island and the river bank in the sleepy Oxfordshire village. First came the sound of bickering from the launch, then squabbling, and then hollering. Finally a loud crunch split the air as the boat ploughed headlong into Clooney’s newly-built boathouse. Two elderly couples had taken this motor yacht, the Juno Too, out for a lazy afternoon cruising the backwaters of the Thames on the Berkshire-Oxfordshire borders. The scene unfolded as they returned to moor at the Upper Thames Motor Yacht Club, opposite Clooney’s island estate. Coming in at speed, the four soon discovered the stretch of water between Clooney’s island and the moorings at the yacht club was only about 50 feet across and – importantly – made even narrower by the location of the newly-renovated boat house Clooney recently had rebuilt as part of the house renovations. The skipper attempted a three point turn heading starboard – that’s right for any land-lubbers. But it soon became evident that he had underestimated the rate of knots at which the Juno Too was approaching the manoeuvre. Unable to turn in time and unable to stop the vessel going forward, the skipper looked on helplessly and the boat ploughed determinedly towards Clooney’s new boathouse. 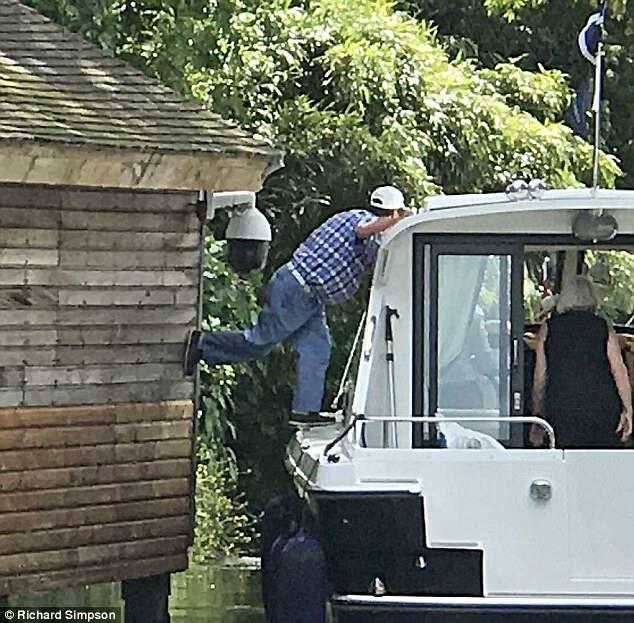 The other white-haired male on board – seen here in a gingham shirt and blue trousers – tried in vain to push the roof of the boat house away out of danger. When that failed to work, as these images show, he tried desperately as a last resort to push at the wall of the boathouse with his leg. All of which must have looked like quite a kerfuffle for whoever was watching at the other end of the CCTV camera which was located just inches from the man’s behind. 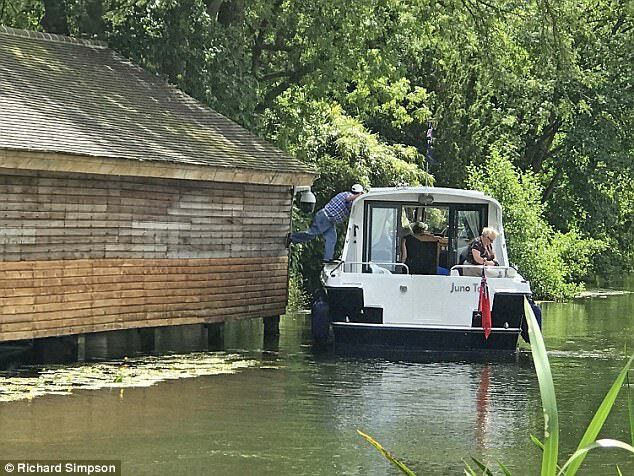 Thankfully, despite the sound of a crunch, it appeared that no damage had been done to either the boat or the boathouse and the rattled pensioners managed to moor successfully at the club opposite and live to tell the tale. However it seems that erroneous spacial judgement might not be the only reason for the shunt on Friday afternoon. The boat house already jutted out into the river course and was subject to a planning issue in the original plans submitted by George, because it was deemed to be too large. 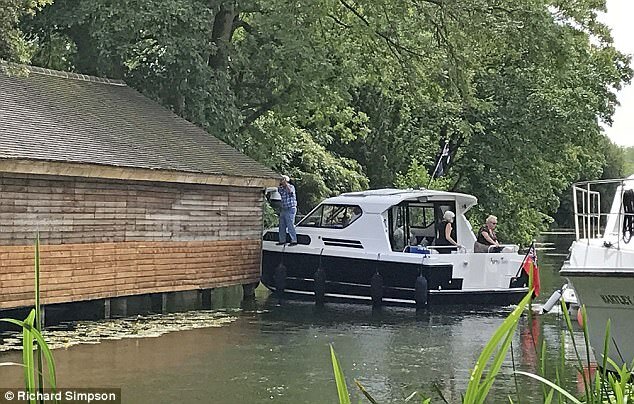 In May 2015, just before renovations began, South Oxfordshire District Council asked for his plans for the new timber boat house ‘the river house’ next to the Thames to be scaled down. Conservation and design officer Samantha Allen said the new building would be far larger than the existing one and it would harm the setting of the main listed building, the conservation area and the riverside appearance of that part of the Thames. The river house and veranda would have stone steps going out into the river. Ms Allen said she would be willing to support amended plans which were proportional to the size of the current river house, which is made out of brick with a slate roof. This was subject to the proposed building being in keeping with the area and materials remaining the same as in the original plans. George and Amal returned to their Berkshire home this week after spending four days at the Lindo Wing of ST Mary’s hospital – where at least four Royal babies have been born in the past few decades. They hired three suites for an entire week, which cost an eye watering £120,000. Ok, 'fess up: which one of yous was this??? Did these people hit the boathouse or did the boathouse hit them? Didn't they see it sitting there minding its own business? Can the boathouse sue for fat shaming? (As apparently people are saying it's too big.) Inappropriate touching? (Look at that man pushing it with his foot!) Assault? At the very least it should insist that these boaters take a refresher course in "u-turns". Seriously, if this was an issue why didn't the people who renovated the boathouse anticipate the problem before they did the work? Gotta admit, practicing that turn on the Xbox made it seem so much easier. Just wondering who took them? PAN - What is that on the left in the last picture? Is it another boat or is it part of the dock at the yacht club? Maybe another boat moored there? It really does seem like a very tight space. The house graphic shows "Kitchen with Italian Chef." Wonder how much the contractors charged to retrofit the chef to Italian, and if the poor guy/woman ever gets to leave the kitchen or is just stored there. Way2Old4Dis wrote: The house graphic shows "Kitchen with Italian Chef." But of course W2O4D!!! The chef must man the kitchen 24/7! What if Amal gets a major desire at 2:30 in the morning for her daily sautéed pea?? ?